On his gray inner robe there are two round red circles - only partially showing - with the kanji characters for "Ichikawa", this actor's family name. They are written in a dark gray color with white edging. The 'ichi' (市) appears above the 'kawa' (川). On the green part of his costume, below his waistline, is a yellow decoration which reproduces, in a modified form, the 'dan' (團) part of Danjūrō - minus the outer enclosing box. Goats rarely appear in Japanese prints even though this animal is one of their signs of the Zodiac. They are more apt to show up on surimono illustrated directly as goats or in some veiled reference hidden within the image or an accompanying poem. It often takes a scholar to figure those out. Oddly enough, it was decades before another woodblock print appeared displaying a goat with so much personality. In late 1860 Sadahide (1807-73) drew an image of two Russians, one standing erect like the fiugre in the Toyokuni print and one bending down to feed a morsel to a long-haired goat. While Sadahide never studied with Toyokuni I he did learn from one of his two main pupils, Kunisada. 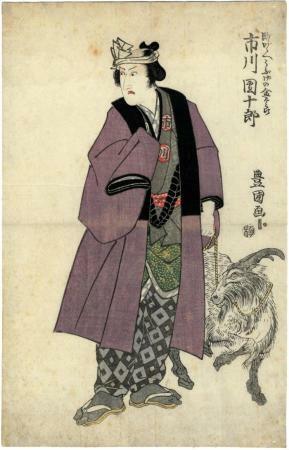 His Yokohama print of the foreigners with a goat may be a coincidence or perhaps he had seen a copy of the print which is now in the Lyon Collection and used it as a jumping off point for his own work.